Welcome to Angkor Riviera Hotel in Siem Reap and step back in time to discover the glory of the ancient Khmer empire and be greeted with Khmer hospitality and style in this modern and comfortable environment. Experience ultimate luxury and enjoy the splendor and elegance at Angkor Riviera Hotel while exploring millennium old temple ruins of the Khmer empire. 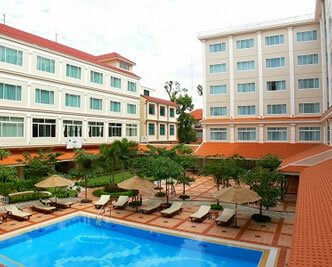 Angkor Riviera Hotel comprise of 191 modern and stylishly appointed standard, superior, deluxe, family and suite rooms. Each room comes fully equipped with an elegant standard of luxury, comfort with modern amenities and commands superb view of the river, swimming pool and the traditional outdoor market. Located in a lush tropical setting right in the heart of the city center, Angkor Riviera is just 10 minutes away from the Siem Reap International Airport and the temple of Angkor. Angkor Riviera Hotel in larger map.